When King Harold of England faced Duke William of Normandy on the 14th October 1066, they both used different tactics to try to win the Battle of Hastings. 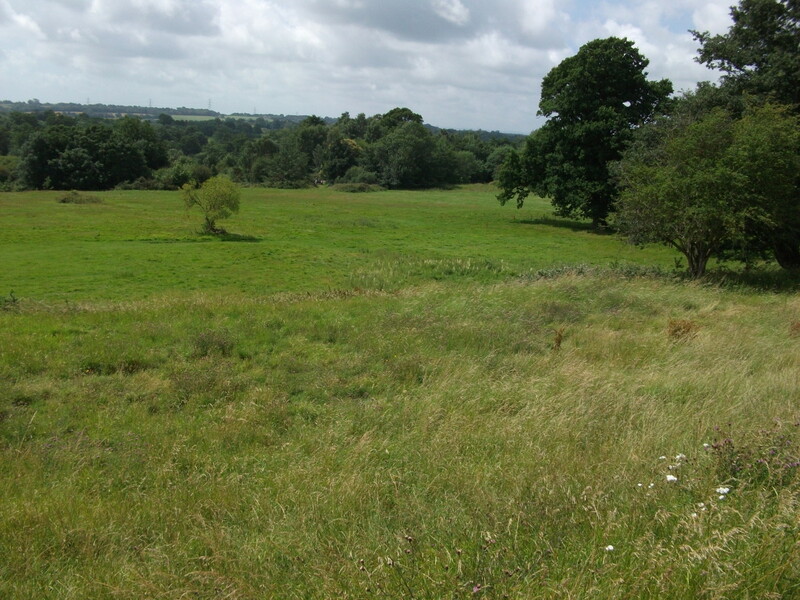 Harold had positioned his 7000 strong Anglo-Saxon army on the high ground at the top of a ridge. His army fought on foot and formed a defensive shield wall many men deep to counter the charge of the Norman cavalry. Duke William's 7000 men of Normans, Bretons and Flemish were formed in three sections of infantry and there was also a contingent of Norman cavalry. 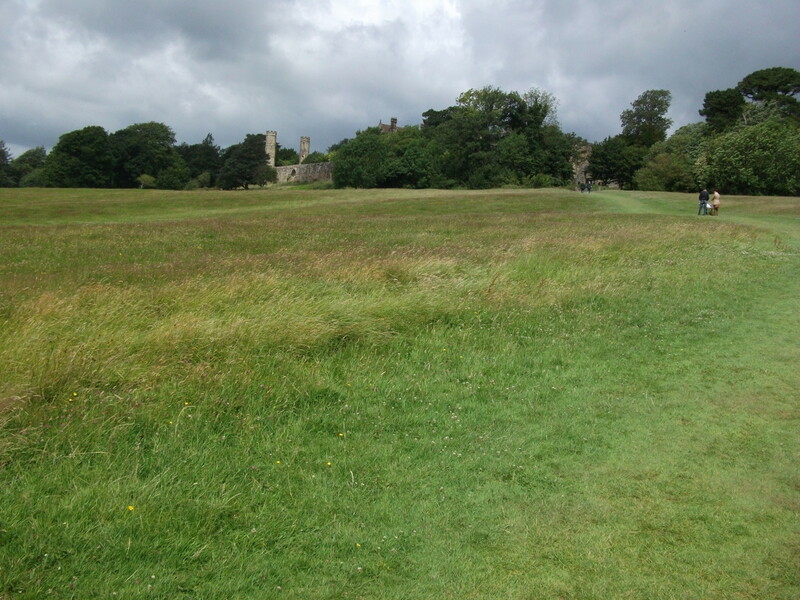 They faced the Anglo-Saxons up the hill that had a steep gradient. The positioning of the Anglo-Saxon troops at the top of the hill gave them a distinct advantage. 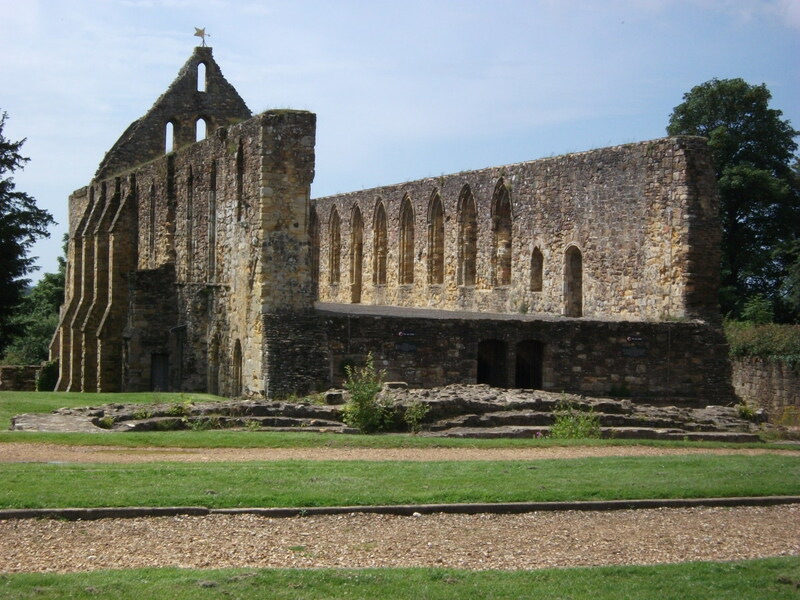 Not only did it give them a bird’s eye view of the battlefield, but also a physical advantage as the onus was on the Norman army to meet the shield wall and break through it after an arduous uphill climb. Even the Norman cavalry had to fight uphill! At the beginning of the battle at approximately 9am, the tactics of Harold and William were simple. Harold’s shield wall had to stand firm and not break, whereas William had to breakthrough the wall. The initial Norman assault of infantry failed miserably and so did the first cavalry charge. It was during this first cavalry charge led by William at the head of his Mathilda squadron that a rumour spread that William had been unseated and killed. His horse had been killed, but William survived with a few bruises and made it back amongst his men. After mounting his second horse of the day, William had to raise his visor to show his face to his men and prove he was alive. William’s first piece of luck occurred in the next phase of the battle. The Anglo-Saxon shield wall was holding firm and the Norman left flank was taking such a beating that the Flemish infantry fell and back and began to run down the hill. Approximately 1000 Anglo-Saxons saw that they were winning and ran down the hill to chase the fleeing Flemish. William quickly saw an opportunity and sent his cavalry to encircle the marauding Anglo-Saxons and trapped them between the Norman lines and the cavalry. This breakout from the wall left it severely weakened and encouraged William to mount another assault. The second major assault also met fierce resistance and ended with severe losses to the Norman troops. It was at this point at about 1pm that modern military strategists believe that Harold should have forced home his advantage and moved the shield wall down the hill about 50 yards. This action would have been totally demoralising to the Normans’ as they were no nearer breaking through the shield wall. To see it advancing toward them may have broken their resolve. It is now believed that Harold chose to remain static as he was receiving small numbers of reinforcements during the battle. He firmly believed that the Northern army promised by Earl Morkere and Earl Edwin would arrive during the battle. A few more thousand men would have changed the outcome of the battle, but as we now know, it never arrived. However, William was not to know this, so his initial objective remained the same; he had to breakthrough the shield wall before any Anglo-Saxon reinforcements arrived or the battle would be lost and with it the English crown. He employed a two-pronged attack that would win him the day. William’s archers were running out of arrows, but he insisted on one last salvo to be timed at a precise moment. William instructed his archers to aim at the shield wall just as his infantry would meet it simultaneously. The Anglo-Saxons could raise their shield to defend a falling arrow, but not keep it against their body to defend a thrusting sword at the same time. This tactic was executed perfectly and the shield wall began to falter. The next phase of the Norman attack involved the cavalry crashing through the weakest point of the shield wall therefore causing panic amongst the Anglo-Saxons. It was during this phase in the fighting that Harold was probably killed and the battle won. Although William did receive a certain amount of good fortune during the battle, it could be argued that he employed the more creative tactics. William was mounted on a horse during the battle and had a good view of the battle as it took place, whereas Harold’s view was restricted to looking over and around the soldiers in front of him. The spot where Harold was killed? Harold Godwinson was killed by an arrow being shot into his eye. 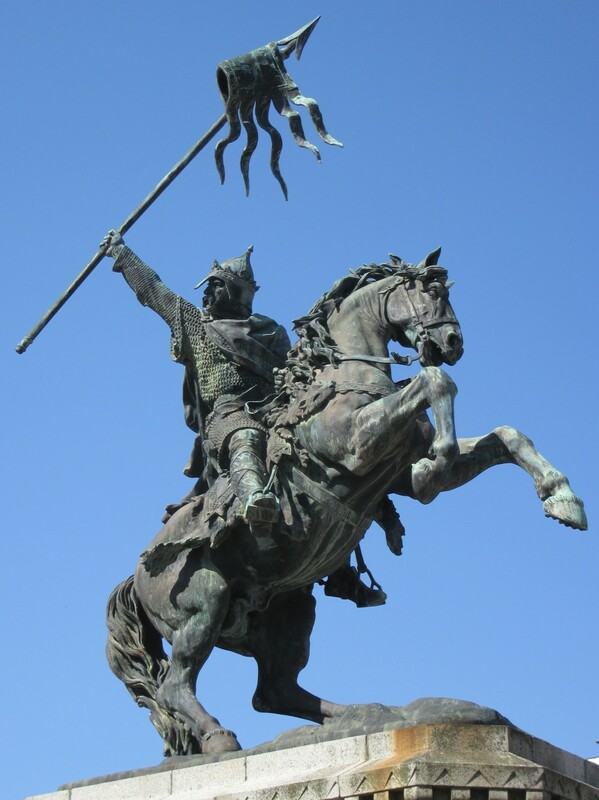 The arrow got shot into his eye at the end when William, Duke of Normandy changed tactics and shot his arrows higher and then fall onto the soldiers. I am glad William won because if not it may change everything and we may not be here today. Anyway, William was known for his fighting and both of these armies were some of the greatest in the world at that time. It was a good fight and both teams fought well but when the Anglo-Saxons chased the fleeing Normans, it opened up a gap in the shield wall leaving space for William's army to attack and break through. Harold was relying on the wall and he was in trouble when this happened. Both teams fought very well but the French got the upper hand. This didn't tell me anything about williams tactics. I suggest to fix this. On a history teacher’s site yesterday, it suddenly occurred to me what happened in the first feint. The whole front line of William’s army was instructed to conduct a feint, but Earls Leofwine and Gyrth anticipated this and were much swifter and cleverer than expected: they rushed the Norman centre and caught Duke William offguard. Down his horse went. Gyrth went straight for William’s bodyguard while Leofwine attacked the exposed Norman left flank. The Normans routed. The Bretons turned and assailed the English right flank, taking heavy casualties but eventually overcoming Leofwine and his men. Meanwhile the Breton commander Alan Rufus led a detachment over a ditch to attack Gyrth’s left flank, reaching Gyrth just in time to save William from being despatched. Gyrth was momentarily distracted by Alan riding at him and swung his axe at the horse which barely dodged the blow. A royal thegn attending Gyrth saw one of William’s surviving bodyguards lunge at Gyrth’s back with a sword; the thegn’s warning came too late. Goodness sake, fellow site visitors! Please pay attention when you read! In case of short-term memory loss, take notes! This did not help at all and didn't include any of his tactics. rubbish website which lies about the battle of Hastings! The weapons and armour (swords, axes, spears, javelins, short bows, crossbows, slings, chain mail, kite shields and round shields) are described in the main article and in posted commentary, and many are depicted on the Bayeux Tapestry. As to the tactics in the battle of Hastings, they were many and various. Harold’s tactics were based on the shield wall, a standard formation since Roman times and used very effectively by Alfred the Great against Guthrum’s Danes at Edington in Wessex. According to the American historian Stephen Morillo, at first the shield wall was not purely defensive. A shield wall can be used offensively by using the weight of many ranks of soldiers to push the enemy back. The ground was marshy in several places and furthermore Harold’s men had prepared the battlefield with pits filled with stakes. The ground was hilly and uneven; in elevated positions and on ridges they had set up stakes as barriers. You can see these defences, and the mayhem they caused William’s army, on the Bayeux Tapestry. Harold had archers and slingers, but the archers were fewer than William’s. William’s intended tactics were to use his archers to thin out the living in Harold’s lines, infantry to force breaks in those lines and fragment the defences and cavalry to exploit those breaks by attacking the separated groups from front, left and right. On an open plain, those tactics would have been very effective, but Harold had the high ground on a ridge with swampy ground below it. Both his flanks and rear were protected by forest and Harold had time to prepare for the battle, though not as fully as he had intended because William’s scouts were swifter so the Duke had arrived sooner than expected. The geography of the battleground meant that arrows from William’s archers lost a great deal of momentum by the time the reached the elevated English lines: if arrows got over their heads at all, the English only had to raise their shields to be safe. The many ranks of the shield wall also meant that their was no danger of any arrows reaching the English commanders King Harold and his brothers Earls Leofwine and Gyrth. Returning to the shield wall tactics: when William advanced his cavalry, Earls Leofwine (from the west) and Gyrth (from the east) each brought a large group of men forward to apply pressure on William’s front lines. With the locations of the stake-pits being known to the English but concealed from the Normans, some of William’s army could be pushed to their deaths. On the other hand, the Breton cavalry were experts in anti-shield-wall tactics: they would rush the shield wall, release javelins which stick in the shields and make them unwieldy so they had to be dropped, feigned retreat only to be quickly replaced by another wave of cavalry. Anyone who is now without a shield is easy pickings for their weapons (swords, javelins, spears). The drawback for William on this day was that the Normans and Flemings were less efficient at this tactic, so between the Breton feint and their next advance, Leofwine was able to exploit the gap and flank William’s left while Gyrth directly attacked the centre. This action was successful: the Normans were suddenly under attack from two fronts, their strategy confounded. William was in a forward position (playing hero), his horse was slain and he fell forward onto the ground. William’s bodyguard rushed to protect him but they were vastly outnumbered because the main body of the Normans, seeing and hearing that William had fallen, assumed he was dead so they retreated. By this time, the Bretons on the left had resumed their attack so they slammed their javelins and spears into Leofwine’s west flank. Meanwhile, Gyrth, protected on the east flank by a long, wide trench of stakes, was preparing to finish William off. However, the senior Breton commander Count Alan Rufus led a group of cavalry to leap over the trench and attack Gyrth from the east. The Bayeux Tapestry suggests that only Alan’s stallion made it. Alan confronted Earl Gyrth and swung his sword back, ready to strike, distracting the Earl. Gyrth swung his axe between the ears of Alan’s horse, which turned its head to evade the blow. One of William’s guard saw the opportunity to stab Gyrth in the back with his sword. A royal thegn (possibly Almaer son of Colswein) standing behind Gyrth was taken by surprise and his axe severed so he could not protect the Earl. Bishop Odo was in view of these events and urged some of the fleeing Norman cavalry to turn around. William was given a replacement mount and showed his face to rally the rest of his army. Leofwine’s and Gyrth’s men were slain en masse, with a few thegns (including Almaer) apparently captured as they turn up again as landowners in Domesday Book’s records for 1086. Harold was now lacking his two lieutenants and many of his best thegns and huscarls (armoured veteran soldiers) and was henceforth primarily restricted to a defensive position. This is Morillo’s analysis of the aftermath of the Earls’ demise. The rest of the Battle was attrition by William’s army against Harold’s shield wall, punctuated by at least two more successful feints. Remember that William had also lost men and Harold’s main shield wall still stood firm for a long time, so when William retreated his centre it seemed credible. Harold’s orders were for his men to stand their ground, but without Leofwine and Gyrth to carry these orders to the flanks, the men were unclear what to do and when. That is the cost of broken links in the chain of command. Moreover, the thinner English lines enabled William to advance his army some way up the slope. His archers could now begin to inflict some damage. By shooting both at the shield wall and over it, they put the English in a dilemma: use their shields to protect their faces or the tops of their heads? With fewer ranks and a higher position for the archers, arrows could now reach Harold’s position. Harold was now facing the Flemings and men of Ponthieu. At some point, Harold was struck by an arrow above his right eye and its vision was obscured by the bleeding. In the late afternoon, the Flemings and Pontevins advanced up the lower east ridge. Count Eustace and three other senior knights, protected by a wedge formation, pried open a gap in the English lines and made straight for Harold. They and their men cut down Harold’s bodyguard, then the four knights chopped the king to pieces. The English fought a while longer, but when the survivors realised that King Harold was dead and William’s army had seized the high ground, they fled into the forest. The Norman cavalry saw this as a rout and pursued the English into the forest. However, it was a trap: their horses fell into further concealed pits filled with stakes and more knights perished there than in the main battle. Helped me with my homework. Thanks. thanks alot!!! I'm having a test based on this and I think I'm going to do a great job!!!! Hay asks: who used which weapon? The Bayeux Tapestry depicts many of the weapons used by combatants. Earls Leofwine and Gyrth and the huscarls: axes. Many English infantry and “French”(-speaking) cavalry: spears and javelins. Some English and many “French”: bows and arrows. 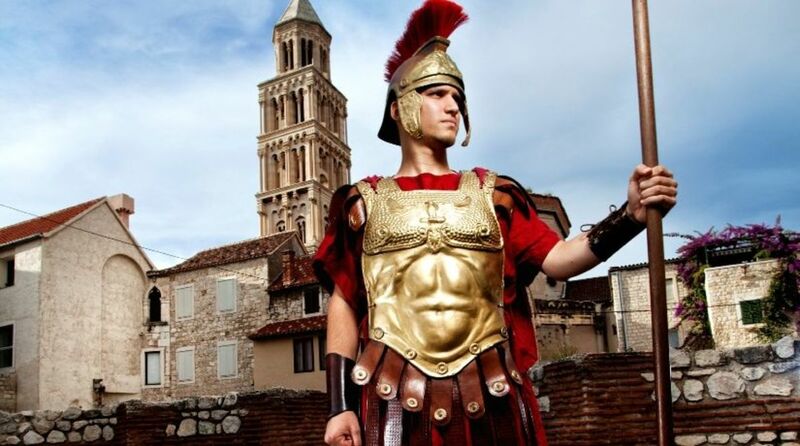 I read somewhere that the Bretons brought: axes, spears, short bows, crossbows and javelins. There’s one scene where a “French” soldier appears to be attending to the head-wound of an English soldier. wow! its amazing! it helped me with my homework but I wish they put who used which weapon. This is actually an amazing website as it helps with homework and revision. Everything is written clearly and it’s great help. wow this website is much better than i thought and this helped me with my homework too. BEAN! very useful for homework. Thanks so much man.It really helped with my homework. This was so helpful! Thanks so much for giving so much detail. Some websites say that Harold had a third of the amount of people in his army than William had but others, like this one, say it was fairly even with about 7000 on each side. its basically 1 in the morning and im still doing homework. this actually helped, and i am soo thankful ._. Thank you so much this has helped me for my humanities assignment. Thank you so much for this article! Helped me in my assignment and thanks to you it's looking great! Paul gave several tactics William used at Hastings. Technically, the feint was a Breton specialty, but the Normans learnt it from them. At Exeter, William undermined the city walls. At Ely, he tried building pontoons across the Fens but they sank or broke. In the North in 1069-70, he devastated the farmlands (rather more than he intended - it was a bitter winter). Castles were his favourite tactic - ok, strategy. He had lots of tactics, and when he couldn’t think what to do, he had tacticians with novel ideas of their own. His advisers were good at more than war: they included architects, diplomats, businessmen, you name it, they could do it. Thank you very helpful as well as interesting photos! The Bayeux Tapestry is circumspectly revealing. See the Wikipedia article on the Bayeux_Tapestry_tituli, Scenes 51 to 58, for snapshots of the battle of Hastings. To judge by the accounts from Normandy and Ponthieu, when word travelled that William had fallen, the English were confidently advancing and the Normans about to flee, during which scenes 52 and 53 occurred: these show the Breton knights tearing through the English front lines to the mortal dismay of Earls Leofwine and Gyrth. Didn't williams army pretend to flee, then slaughter harolds? "1000 Saxons broke the shieldwall? Where did you get this figure?? mia, shield walls are vulnerable to several tactics. 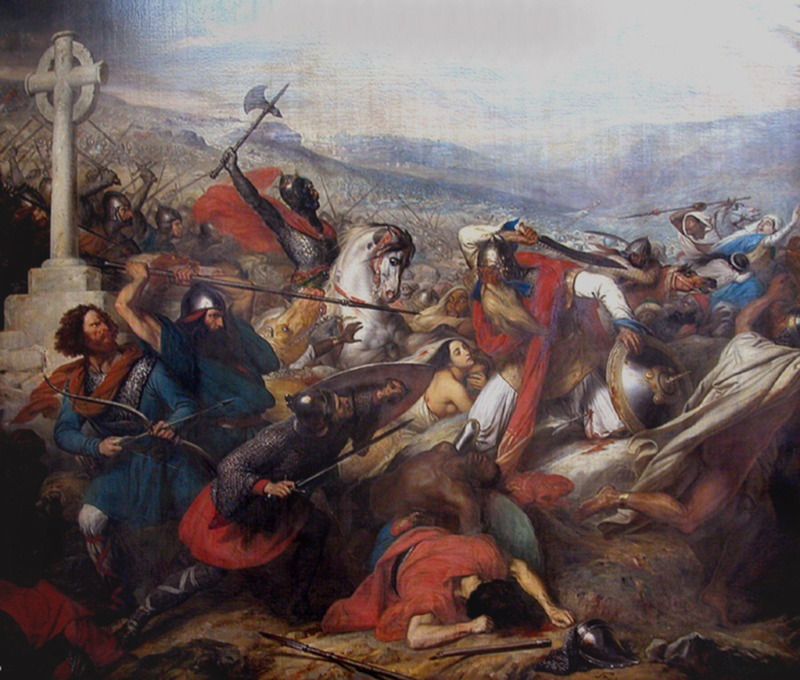 At Jengland in 851 the Bretons used such tricks to destroy the Frankish and Saxon army of Charles the Bald. The Normans subsequently learnt these. At Hastings, William's army had to achieve the following: keep William alive, stop the damaging downhill assaults led by Gyrth and Leofwine, thin the shield wall, reach the top of the hill, break through the deep English lines, converge on Harold, end it. The English had to reach William, unhorse him and kill him by any means available: spear, sword, axe, stones. The Bayeux Tapestry and a few contemporary written accounts describe various episodes that occurred that day. These provide snapshots of the progress of the battle. Reaching William was easy as he was in the forefront of the action. He was unhorsed three times according to one account. At least once he was nearly killed. Now we return to the Norman tactics. Gyrth and Leofwine were stopped when a promising attack on William failed and Gyrth and Leofwine were killed. In the confusion of the melee, most of the Normans could not see what had happened and, seeing the Bretons going backwards, they panicked and began to flee. Sensing victory, the front lines of the English shield wall gave chase. At this moment, William, who had been given another horse, raised his helmet and called out that he yet lived. Someone (I believe Alan Rufus) led some of the Norman cavalry behind the emboldened Englishmen, while the Bretons on the left wing turned around and attacked them face on. The pursuers were surrounded and systematically cut down. Arrows could not do much harm shooting uphill while the shield wall was many ranks thick, especially as anyone who climbed the hill had numerous projectiles cast down on them and the bravest attackers were likely to be struck by spears, javelins and axes. However, the feint had thinned the ranks and the wall contracted to keep the defenders shoulder to shoulder to provide full shield cover. Successive feints drew out more of the over-exuberant and less disciplined English and the wall shrank until the shortbows and crossbows could shoot arrows over it to the officers standing behind it. William was then able to order half the archers to shoot directly at the shield wall while the others shot overhead. This meant that if a man's front were shielded, the top of his head was vulnerable, and conversely. You can imagine the mayhem this caused. 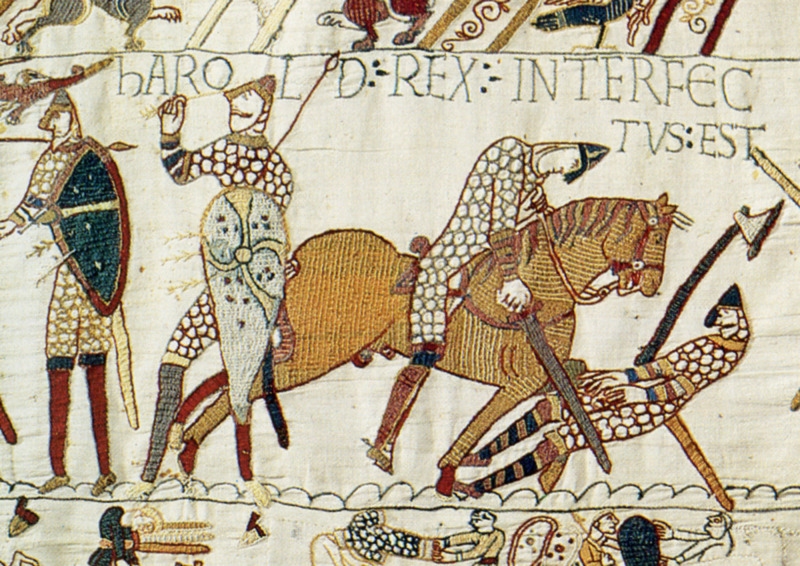 It's possible that an arrow may have wounded Harold, but the Bayeux Tapestry at most shows a glancing blow against his helmet. It may have stung, bruised, even caused bleeding from the forehead, partially obscuring his vision, but the character shown seems still to have the use of both eyes. Due to the wall receding, the Bretons reached the hill on the left and pressed toward Harold. He responded by moving his command post East. At this stage the outcome was decided, but the sun still shone so if the English had fled, few could have hidden long. A few knights from Flanders and Ponthieu formed an assassination squad, broke through the defenders on the right and reached Harold, cutting down and into pieces. The surviving English kept fighting past sunset. As night fell, they fled into the woods. Pursuing Norman cavalry pitched into prepared pits filled with stakes: this Malfosse reputedly cost more Norman lives than had the preceding battle. So the English showed cunning too. did William use a trick to break the Saxon's battle line? The reasons for the Norman invasion have been discussed by many people, including Paul Bailey and Alan Lancaster (see links to articles above). In brief, King Ethelred II had a dispute with the Danes who had settled in the north and east of England, so he killed many of them (St Brice's Day Massacre), including a royal princess, which led to military retaliation from the Danish King Sweyn Forkbeard. Sweyn's son Cnut subsequently conquered England, causing Ethelred's son Edward to seek refuge with his mother Emma's family, who ruled Normandy. But Cnut married Emma. Edward issued charters in Normandy declaring himself rightful king of England, but he had to wait for Cnut and Cnut's sons to die first. Meanwhile, Earl Godwin of Wessex captured Edward's brother Alfred and handed him over to be cruelly killed. Edward of course regarded Godwin as a traitor. Edward was in a bind, and his most strenuous efforts at the most opportune time succeeded only in exiling Godwin for a few months in 1051 until Godwin returned with an army. It may have been during Godwin's brief exile that the young adult William, Duke of Normandy, obtained Edward's blessing as his chosen successor. Even after Godwin died, his sons grew ever stronger, Harold inherited the Wessex Earldom, East Anglia went to his brother Gyrth and Tostig had Northumbria for a while until irate locals drove him out. Around 1064, Harold was shipwrecked near the Somme and captured by the Count of Ponthieu. 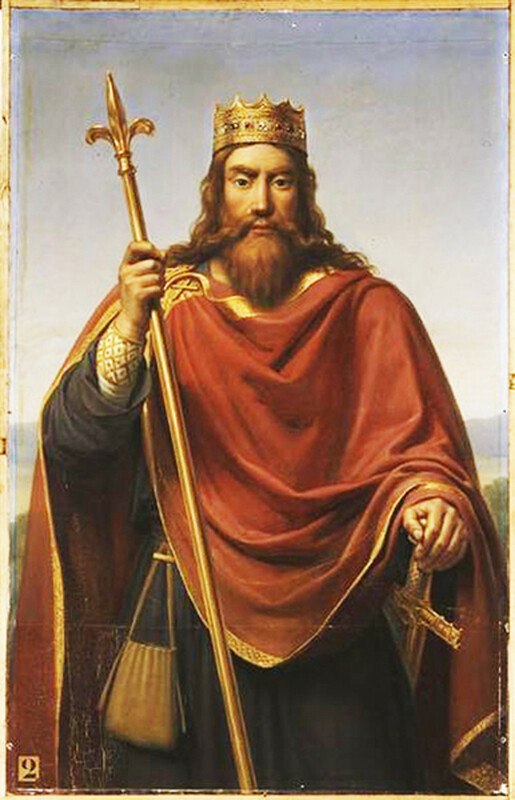 William claimed the captive and took him on an expedition against his cousin Conan II of Brittany. (See Bayeux tapestry.) Harold rescued two Normans from quicksand, was knighted and made to swear fealty (over saintly relics, but Harold wasn't told this). Harold was then returned to England. 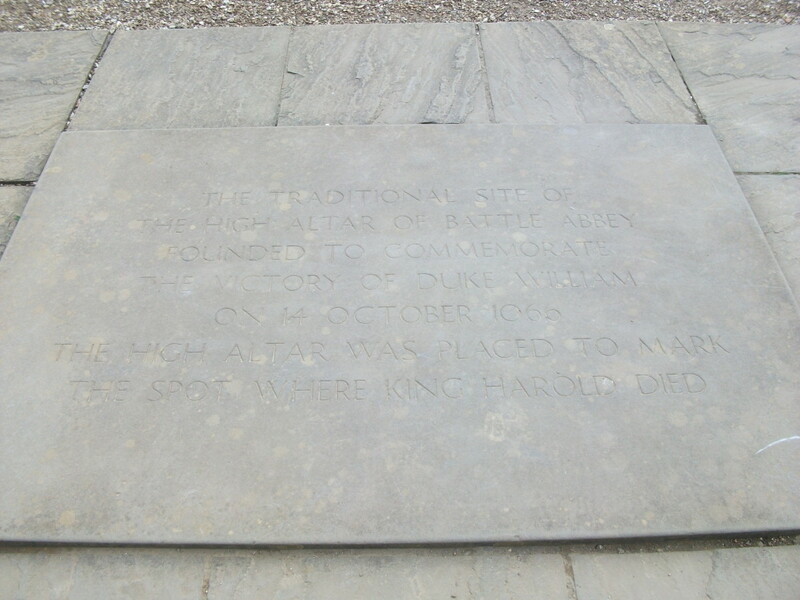 When Edward died on 5 January 1066, Harold was swiftly chosen as king by those members of the Witan (council of senior lords) who were close by. William was affronted, as was Harald Hardraada, king of Norway, who'd had a prior agreement with the Danes. So both prepared to invade. Harold evidently then made the strategic blunder of expelling many of the Breton and Norman ministers who had loyally served his predecessor. These included at least two highly trained military officers, Ralph the Staller and Alan Rufus, who promptly joined up with William: Alan was one of William's many Breton cousins, and Ralph was a friend of Alan's father Eudon, who was King Edward's elder cousin and William's uncle of sorts. Remember Tostig? He felt let down by his brothers in the Northumbria fiasco, and his wife Judith of Flanders (related to Duchess Matilda only by marriage) was a cousin of William's, so he met William, then began raiding the coast, eventually joining up with the Norwegians and dying with Hardraada in a tough fight against Harold Godwinson at Stamford Bridge near York. 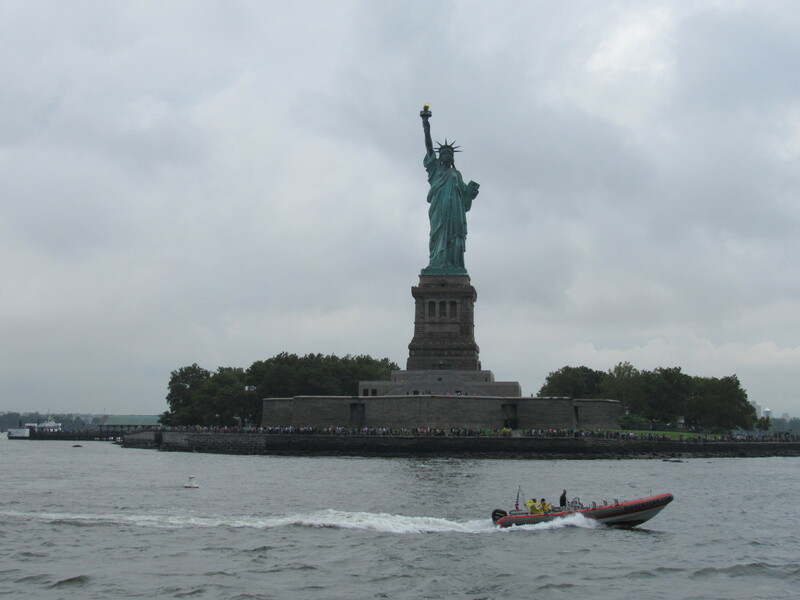 Stormy weather had hastened the Norwegian fleet, but delayed William's, so he arrived just after Stamford Bridge, and set about raiding Harold's personal lands. So Harold raced back to London, collected fresh troops, then marched south. The rest you have a fair idea of. Something I might be able to use along the line in my books. Thanks for that (I've noted it down for posterity, and if I use it I'll add your name to the Acknowledgements page). When I've finished here I'll 'pop over' for a visit. The confusion between the two Alans is a persistent mistake dating back to Wace. Most experts get it right, but the error has filtered into popular genealogies and romances such as Jean Plaidy's "Norman Conquest" trilogy. The exact relationship between the two men is this: Alan Rufus's maternal uncle Hoel of Cornouaille was Fergant's father. Fergant's mother was Alan Rufus's paternal first cousin Duchess Hawise of Brittany. So they're first cousins on one side and first cousins once removed on the other. Both men had red hair and were formidable military commanders. William the Conqueror had zero success against Fergant, so William gave his daughter Constance to him as wife - to appease him, I suppose. Most knights in those days wore (leather?) gloves which wore out regularly with heavy riding. While under siege for rebelling against the young Duke William, Roger I of Montgomery poisoned a pair of replacement gloves to kill Alan III of Brittany, Fergant's maternal grandfather and William's guardian. Assuming the poison is not something like Gallium that enters the bloodstream through the skin, I think it is ingested when the wearer uses a hand to wipe their mouth. Roger II of Montgomery did the same to Conan II, Alan III's son: William got the blame for this, though he was in England at the time. Fergant probably cottoned on to this, so he wore gloves that didn't wear out. I bet Alan Rufus was smart enough not to fall for this poisoned gloves trick when Roger II rebelled in 1088. So he may have worn iron/steel gloves, too, perhaps. If so, Wace may technically have been correct, though jolly confusing to the rest of us. Seems some of my sources are up the Swannee, zoetropo. Thanks for that. We only got the bare bones on the Norman Conquest at school. Not many wanted to know even that much, not many were expected to remember. These days schools are 'exam factories' so detail is brushed over for the sake of 'mileage covered'. I find that primary school children can handle copious amounts of detail. Even more when they're keen on the topic. In my experience it's the adults who are by far the most impatient and thus an obstacle to the children's learning. As to Alan "Fergant" (in French this means "Iron-glove"; I suspect I know why), this name is given to Duke Alan IV, a closer-than-cousin of Alan Rufus. Interesting addition by zoetropo about Alan 'Fergant' ('The Red'). He was given land around the River Swale (North Yorks) and built a castle on a cliff overlooking the river. This was the 'Honour of Richmond', in time surrounded on three sides by housing that developed into the market town of Richmond. After Alan 'The Red' died late in the 11th Century his cousin, Alan 'The Black', Count of Brittany took over his lands (as well as Gunnhild, younger daughter of Harold Godwinson). Not a lot of people know that. They don't teach it here on the basis of 'too much information confuses'; you'd have to take it up at university. Thank you for your comment and interesting information zoetropo. It is unfortunate that 1066 is only touched upon in schools nowadays. Stephen Morillo (editor of the Battle Conference) has an interesting analysis of the turning point of the battle. According to several pieces of documentary evidence, Gyrth led a frontal assault on William's position. William's horse was cut down from under him and he fell facedown in the mud. Gyrth sought to slay William while he was prone, but someone stopped him, Gyrth was killed and without his experienced leadership on the frontline the English lost momentum. William's propagandists say that he cut Gyrth down, but Domesday evidence is that one of William's Breton allies, either Ralph the Staller or Alan Rufus, rode to his rescue. Alan commanded William's household knights, while Alan's brother Brian led the left wing with Aimery/Haimo, Viscount of Thouars. This placed Alan in the perfect position to coordinate feints with Brian: one would draw the Saxons forward, the other would follow in behind them, and together they would encircle them. This was a modification of the tactics employed by Bretons for centuries. Look up the Battle of Jengland (851) for a spectacular example. Due to his uniquely chivalrous treatment of the defeated, Alan won the respect of the English and the love of Harold's daughter Gunhild. This also made him many enemies among the Normans. In 1088, Alan led the loyal few in alliance with the English Fyrd, to victory over Odo of Bayeux's barons, followed up in 1091 with the annexation of half of Normandy. Why the English history textbooks don't teach this, I do wonder. Hi Charlotte thanks for your question. The Norman cavalry has been estimated between 1000 and 1500. Most of these were transported across the Channel with William's main flotilla but a considerable number would have been corralled in England during the few weeks of pillaging by the Normans. Really good for the history essay I'm writing on why William won The Battle of Hastings! Very detailed but not too much writing or waffling. Very interesting page which explains a very famous bit of British history in just the right amount of detail. Hello it's me again Storybailey. 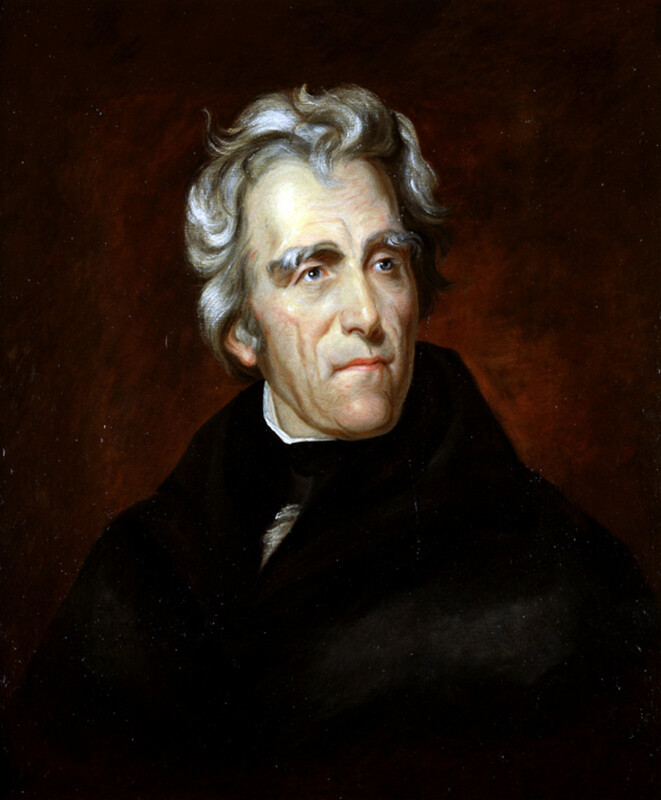 William had two horses cut down from under him during the battle. He asked Count Eustace (Eadward's brother-in-law) for one of his mounts but was refused. Needless to say, when Eustace was among the three knights who cut Harold's body up after the battle he was in disgrace. That bit about the young earls Eadwin and Morkere promising men to fight alongside Harold on Caldbec Hill is a new one to me. They had arrived in London and fought alongside the aetheling Eadgar when William tried to storm across London Bridge some time later. Earl Waltheof, who in making excuses about going back to find his own men from the Bedfordshire area, saved his own bacon. There were survivors, including Ansgar, the shire reeve of Middlesex (who was Harold's 'stallari' or marshal) and Harold's nephew Hakon were amongst many who reached London to raise awareness of the king's defeat. The young Eadgar was made king but not crowned, as the church men now saw William as Eadward's real heir. William was defeated at London Bridge and retreated back into Kent with his survivors. When William ravaged his way around the Home Counties he cut off London's food supplies and the Witan met him at Berk-hamstead to yield the kingdom. The Witan included the earls - Eadwin, Morkere and Waltheof - and senior clerics. Earl Gospatric of northern Northumbria being still at Bamburgh was not with them. Hello again Storybailey. Interesting Hub you've got here. I suppose there are variations on the course of the battle. I've used a couple that agree on the Bretons being sent uphill first, on the left of William's line. They were repulsed and fled back downhill, pursued by part of Harold's shieldwall. These were locally recruited fyrdmen with their thegns, lacking in the discipline imposed by their counterparts at Staenfordes Brycg (Stamford Bridge) about a fortnight to twenty days earlier on September 25th. The custom was that if you didn't send men, you sent the supplies and food for those who answered the summons. The South Saxons had been doing the former and thus their fighting skills had suffered. William's cavalry had gone across to their left to support the Bretons and cut off the South Saxon fyrdmen from their support, isolating and destroying a spirited fight-back by said fyrdmen and their thegns. Reports of William's 'demise' came later, before 'half time' in the early afternoon. He realised that by 'feinting' retreats or routs he could draw more of the Saxons and Kentishmen. Thus by early evening, and within hours of darkness he had weakened Harold's shieldwall. Harold's own men - who had ridden north and back within a fortnight, including walking wounded - were a mixture of Saxon, Anglo-Dane and Anglian (the choice of king's thegns and huscarls), largely from the former 'Danelaw' region of England due to their more militaristic outlook on maintaining training. The men who fought alongside Harold in East Yorkshire had been collected on the way north through the eastern shires and southern Deira, and left the main force on its way back to London by the beginning-early October. Harold wanted to press on against William despite advice to the contrary - the only brother he would have listened to was Tostig, and he died side-by-side with Harald Sigurdsson - on the grounds that he was defending his own people (his grandfather thegn Wulfnoth was a local landlord in the Sussex area). He expected his reinforcements at the Hoar Apple Tree above Caldbec Beorg (Caldbec Hill). Even as Harold was slain by Count Eustace, Walter Giffard and Hugh of Pointhieu - who disembowelled him with his lance, Giffard cut off his manhood - there were men coming down from the meeting point, but on learning Harold was dead fell back into the Weald. An accident of circumstances defeated Harold, but his own judgement also let him down. Verdict: tiredness kills, take a break!